Noahmund is a Fantasy RPG, set in the world of Feros, a war wages on. Love, fear and fire as they say, the game follows in our protagonist, Galina Angstroud, an agent of Shinn who is on a quest for truth and salvation. I’ve had some time with the game since last week and gotten far through it – So what did I make of this new indie title? Were the characters captivating, or just chatty? All of that and more revealed below. Feros has been ravaged by war, which left young Galina Angstroud without a father. Taken in by Master Quiva’Luin, Galina became an agent of Shinn, in the hopes to uncover the truth behind the war. Accompanied by her Guardian, Berani, who has devoted his life to protecting her, Galina finds herself and Berani trapped in some ruins, where they come across Stalos. Being a Firebrand, Stalos cares little for the war, but inadvertently finds himself getting involved, if only because he knows how useful Galina’s powers are. This is an RPG, which means in this case you have a small team of characters, who you can equip and level up. You can edit their powers, which I’ll explain more about later. You can change who you take as your active character with the press of the tab key and, interestingly, you move and fight in a grid-based system. There’s also a puzzle element in the game, which adds quite nicely to the game. When you’re travelling around, you are given directions you must face in and press E (if using keyboard). I used this as well to test how the game went between keyboard and gamepad and it works incredibly well, it’s a seamless transition. However, I mostly opted to use the keyboard, as I did find the gamepad version a little more confusing, but the game is overall well defined in what you need to do – I just started with the keyboard so stuck with it. As you travel, you will encounter fights, which you press a corresponding button, face the direction you’re aiming it and press the spacebar. 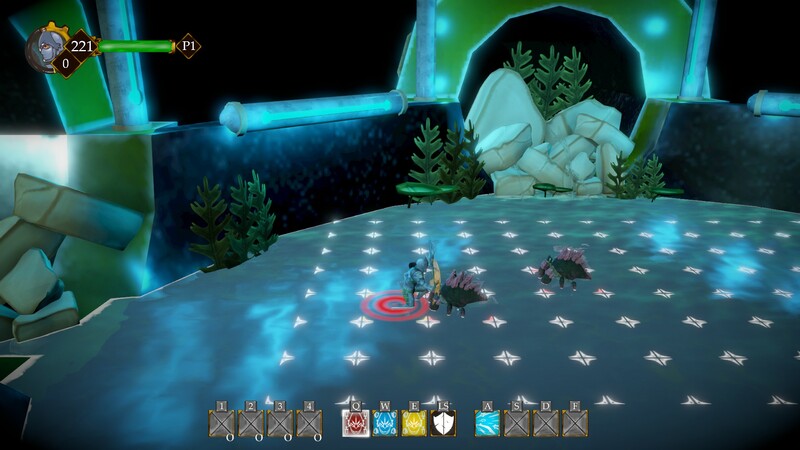 This can be a bit of a laborious effort, however the combat is well paced, to where you typically don’t end up too flummoxed. Indeed, the game has a really good flow to it, mostly thanks to the grid-based system you move around in during a fight. As mentioned previously, you can switch between characters by pressing the tab key; something you can do both in and out of combat. 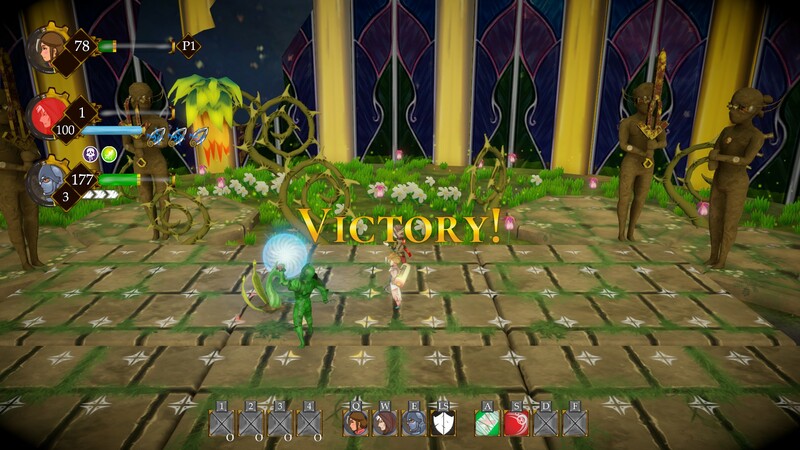 You pick up items throughout the game, which can be used in combat, or out of. Things such as your typical healing items, status ailments and the likes all exist. You can equip these in a quick-access bar, allowing you to use them in combat. 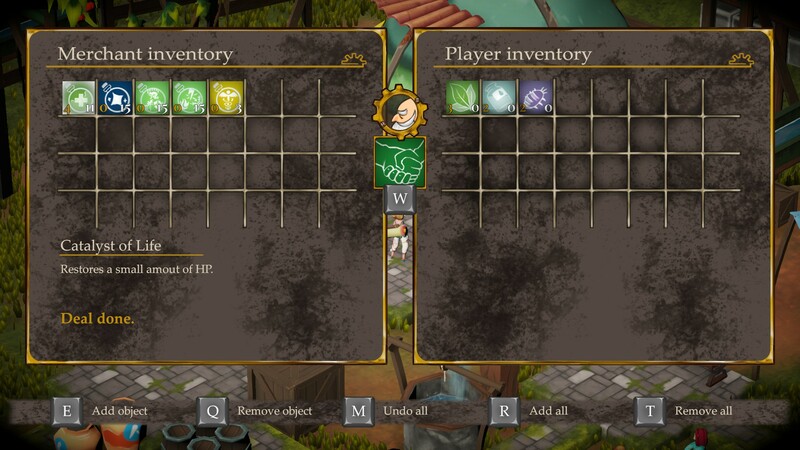 Furthermore, you will get items which you can equip throughout the game, which increase your stats. On top of that, you can get items which augment your abilities in combat, changing them from one style, to a different. An example of this is an item which changes Stalos’ lightning attack from a 3-square ahead beam, to a charged attack that on impact damages enemies in a cross shape. As you travel through the game, you will meet NPCs who you can deal with in various ways. Some you can trade with, some will give you items to deal with tasks. I’d like to priase the trading system, as it’s a smart way of doing trading without just grinding for gold. It’s also worth chatting to as many NPCs as you can, as they give a good bit of backstory. As a final note, there are puzzles throughout the game. There are traps, in which you must follow a sequence of inputs correctly within an allocated time. This is something I found incredibly easy, so perhaps this could be ramped up in difficulty in future? However, there are floor-puzzles, where you have to move between tiles in an allocated time and more. This appeared to be a bug, as you couldn’t go up that way! The audio of the game is pretty nice. It’s nothing that’d you’d be humming for days after, but it fits the theme of the game pretty well. Ruins feel intimate, grand layouts feel grand – All in all, it feels like the developers put a good amount of thought into the music of the game. There are no in-game voice actors, but there are noises in the game, such as laughter. Admittedly, there’s one laugh which really sounded awkward early on, but it didn’t take away from my enjoyment of the title. An interesting point about Noahmund, is this game has scored really well under the Square Enix Collective rating system. This is a feature that allows people to get games that people care about under the Square Enix umbrella. It’s understandable why they would want to get this game under their banner, as the style is undoubtedly something akin to that of the RPG classics under their name. I found Noahmund to be pleasantly charming and unique in many ways. The gameplay is certainly something I’ve not experienced for a very long time, if ever before… The story is nice, albeit a little bit disconnected at times. As a positive to the story, the characters end up being very likable for different reasons, so that really made me happy. You’ve got to give it time, because at the start there is a lot of dialogue. All in all, I enjoyed Noahmund greatly. I think it’s an indie title that’s certainly worth checking out if you get an opportunity. I didn’t mention this before, but there are a few bugs around. Some of these bugs include when you kill an enemy at the same time as it kills you. I really hope the developers take note of this and address some of the bugs. If they ask, I’ll even try to replicate them! Anyway, go check it out on Steam and enjoy a unique title (that’s rare to say in 2018)! Leave your thoughts in the comments below, or over on Facebook and Twitter. This entry was posted on August 8, 2018 by Timlah. It was filed under Gaming posts, Reviews, Video Games and was tagged with 2018, Action, Indie, New Release, Noahmund, Review, RPG, square enix, Square Enix Collective, Studio Abrego, Unique Game, video game.